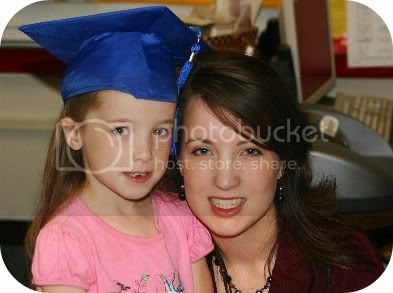 My baby girl has graduated Kindergarten! ~~Dustin and I truly are proud of the little lady she's becoming. She's grown so much this year. She can read and write. She can count and do math. She's so cheerful and outgoing and has lots of friends. It's exciting to watch her go through each new stage but at the same time it hurts my heart. She's my first-born. The one who made me a Momma. And she's growing more and more independent every day. Somebody told me that Kindergarten graduation means that they're no longer babies. Nope. I won't have any part of that. No matter how old she gets, she'll always be my baby girl. Here's a tissue!!! I'm amazed at how fast they grow up just from being in kindergarten. I have a little girl who's a socialite too. She and I are total opposites! She loves crowds and I stay away from them. All the emotions you are experiencing today! I must say this is a moment I miss your Nana even more, as I am sure you must also. I would have been able to hear all your emotions in her voice as she told me all about it. Thank you so for your blog. Oh I miss her so much too Pam!!! I came home from graduation and thought, "I need to call Nana!" Just as soon as I thought that I got a lump in my throat because I remembered. It's so hard. Awww, she's so purty! :) Congratulations on her graduation! She does look like she is ready to take on the world! Congratulations, she is beautiful like her mom. :) They grow so fast. My baby boy is 32 .. wow! Seems like yesterday. Oh Kasie, what a proud mum you must be. Your girls are so beautiful. You're right, they will always be your babies. I think that of my Savanna, even when she's my age she will still be my baby in my eyes. 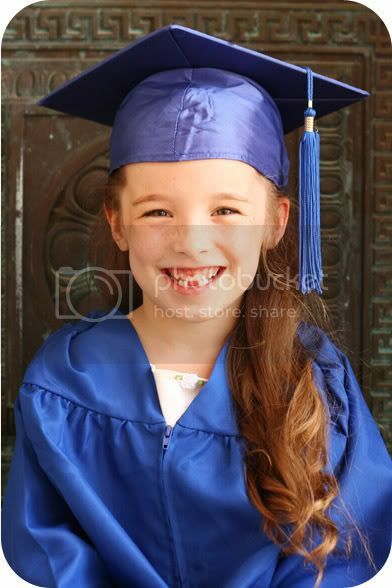 What a special occasion, kindergarten graduation, the perfect time to celebrate all of your daughter's achievements and everything wonderful that she has become. I hope that you are all feeling better and that the second round of strep isn't creating too much havoc in your household. Oh how sweet!! She looks lovely! I love the Mother/daughter picture! You deserve a diploma too...I always think that when a little one graduates! Aww, they grow up too fast! Cute shot of you & Sierra!